Eugene is delighted to announce his entry into this years’ Galway International Rally. This has been achieved with the joint support of Colm Quinn – MINI and BMW (Athlone and Galway) who has entered a two car team with Dean Rafferty a local Galway native joining Eugene in a similar MINI WRC car. Once again, the MINI WRC will be supplied by Mc Geehan Motorsport who played a pivotal role in securing the deal for Eugene to take part in the event. 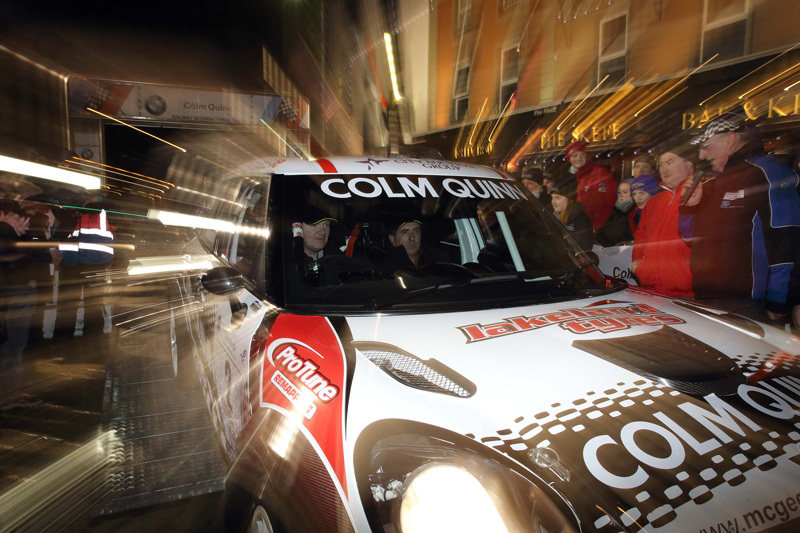 “I am delighted to be part of the Galway International Rally again this year. It is one of my favourite events, though I think it will be difficult for me to get on the pace. Realistically I am not expecting any major overall result” Eugene went on to say “My last outing was in the Circuit of Ireland last year. I will be back in the Right Hand Drive car that I competed in Galway last year and very much look forward to partnering Dean who is without doubt one of the brightest new talents in Ireland. Dean won the prestigious Billy Coleman – Young Rally Driver of Year Award and was also crowned BRC Rally 2 Champion in 2014 and I look forward to offering him as much support and advice as I can”. As a build up to the Rally, Galway Shopping Centre are hosting a Road Safety Awareness campaign. The event will take place this sat 31st Jan with Eugene and Da‎nielle Murphy (European Drift Queen Champion) being in attendance with their racing cars from 12 midday until 2 30pm. Eugene will have his Colm Quinn supported Mini WRC car at the event and Danielle will also be bringing her specially built “Lakeland Tyres supported Nissan drift car. Both Eugene and Danielle will be available for photo and autograph opportunities. Speaking at the launch of the campaign Eugene explained how important the message of road safety is. Also speaking at the launch Danielle ‎offered her full support to the event. “My followers are generally quite young and I cannot stress how important it is to take heed to these messages and appreciate how dangerous the roads are. I hope that this campaign can make a difference especially to make young drivers aware of the responsibility of their actions. If we can prevent an accident and save a life then this will all be worthwhile”. As the countdown to the Rally begins, Eugene would like to once again thank everyone who has offered their support, with a special thanks to long term sponsors Pro-Tune and Lakeland Tyres. “It will be a hectic few days preparing for the Rally but as usual I am really looking forward to it. What else could beat the atmosphere and excitement of the Galway Rally”. Visit the Donnelly Motorsport Facebook page for regular updates.